Brazil is one of those rare countries where what your preconceived idea of it is probably true. The music, the white beaches, the wildlife, the food, and home to the friendliest people in the world all check the boxes and make Brazil nothing short of an exciting place to study abroad. As the fifth largest country in the world, Brazil takes up nearly half of South America. This gives students more than 4,500 miles of coastline to explore and make their temporary home! Brazil is such a good pick for international students because currently two Brazilian Reals are equivalent to one U.S. Dollar. This means that most of the prices in Brazil are half the cost of that in the U.S. Despite being a developing country Brazil has many world-ranked universities and is home to some of the best educational institutes in South America. Public universities in Brazil are more highly regarded when it comes to education. This is because public universities rely solely on a difficult admission test versus the private universities which are for students who didn’t pass and can pay the private tuition fees. 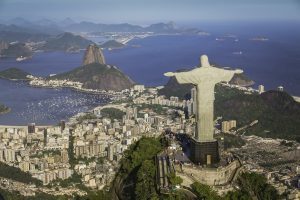 Whether you know Portuguese, one of the most important languages in the world, or you want to learn then Brazil will make the perfect study abroad location for you. Many students who study here choose Brazil to deepen their understanding of Latin American students or learning/improving their Portuguese. Other popular courses in Brazil are international business, law, humanities, economic, and political sciences. There are also many volunteering opportunities for foreign students in local communities in need of assistance which looks outstanding on a resume! The size of Brazil is a major benefit to study abroad students because it means they have a wide range of selection for where they want to study! There are ‘hidden’ cities surrounded by rainforest that are only accessible by river and other cities that boast year-round sunshine. Places like Rio de Janeiro that are metropolitan and known for a good party and the country also offers cities within jungles. Your choice truly depends on what type of experience you want to have! UFRJ is Brazil’s oldest university and is ranked 5th in Latin America and 321st in the QS World University Rankings 2016-2017. There are currently nearly 67,000 students enrolled. The university is very well known. It owns several museums, hospitals, and research facilities around the city of Rio de Janeiro. 30 of the subjects offered here are ranked highly among the world’s top universities. Without a doubt, one of the most popular cities for students to choose is Rio de Janeiro. Rio offers a taste of all that Brazil has to offer in one city. It’s the number one spot for parties and its coasts are along the famous Copacabana and Ipanema beaches. Florianopolis is another popular city for study abroad students. The area is known for its beaches and saltwater lagoon while providing island and cosmopolitan vibes. How is that even possible? You’re going to want to find out for yourself. Salvador da Bahia is the northeast city that offers amazing beaches, phenomenal seafood, and a completely different culture than the other large cities. The most popular lodging for international students studying in Brazil is homestays. Of course, there are options for students to partake in shared apartments but students usually choose to live with a host family. There is no better way to emerge yourself into the culture and get some authentic help with learning (and practicing) the language than living with a local family. Don’t expect the international department at your university in Brazil to offer you on-campus housing like in America. Brazilian universities don’t typically offer campus housing, but they will assist you in arranging your homestay. In order to travel abroad, all students must have a valid passport. The passport must have at least two blank visa pages as well as be valid up to 6 months after their return date. In regards to visas, students need to apply and obtain a Vitem IV student visa prior to their arrival. Student visas in Brazil are valid for one year and can be renewed if necessary which is good news for travelers. Visa holders are not allowed to work to make money. Recent passport photo printed 2”x2”. We recommend using the Passport Photo Creator mobile app for passport photo prints. Proof of financial ability to pay for one’s stay in Brazil. This includes bank statements or paychecks.